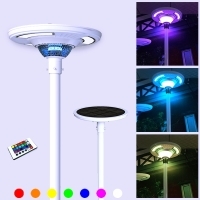 Multi Color Solar Landscape Plaza LED Light with Remote Control. Model ELS-30RC has 7 Colors Including White. No Worries About Cloudy Days. Built-In Solar Panel Charges Quickly and Will Produce Lighting for 3-5 Days per Charge. You never have to worry about these lights not working. 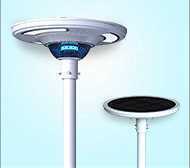 The Round Plaza Solar LED Light has a high powered solar panel and charger built-in for fast charging with extended lighting capabilities. These lights will turn on and work for3 -5 days per charge. Automatically lighting when dark along with an auto-off mode during the daytime. 5 hours of full bright lighting + dimmer light until dawn, as to not disturb nature. 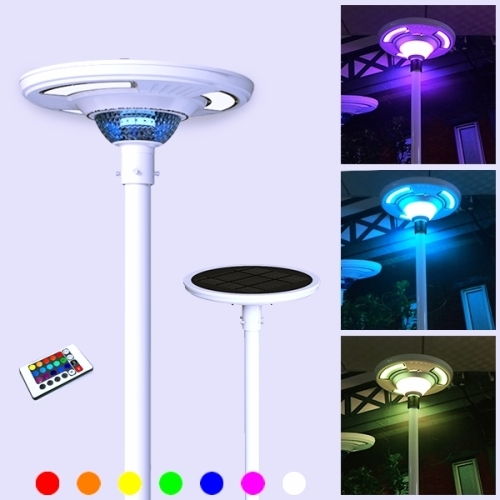 When you activate the switch, the RGB Landscape Plaza LED Light with Remote Control can display any of its 7 color choices, including white LED lighting and RGB LED lighting.